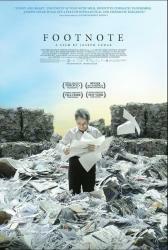 Drama, Israel, 2011, 103 min. Synopsis FOOTNOTE is the tale of a great rivalry between a father and son. Eliezer and Uriel Shkolnik are both eccentric professors, who have dedicated their lives to their work in Talmudic Studies. The father, Eliezer, is a stubborn purist who fears the establishment and has never been recognized for his work. While his son, Uriel, is an up-and-coming star in the field, who appears to feed on accolades, endlessly seeking recognition. Then one day, the tables turn. When Eliezer learns that he is to be awarded the Israel Prize, the most valuable honor for scholarship in the country, his vanity and desperate need for validation are exposed. His son Uriel, meanwhile, is thrilled to see his father's achievements finally recognized but, in a darkly funny twist, is forced to choose between the advancement of his own career and his father's. Will he sabotage his father's glory? FOOTNOTE is the story of insane academic competition, the dichotomy between admiration and envy for a role model, and the very complicated relationship between a father and son.